notes Ladies jewel size, key wound and key set, 18k gold and enameled hunting case pocket/pendant watch with diamond gemstones, unsigned, made in Switzerland, circa 1870-1880s. 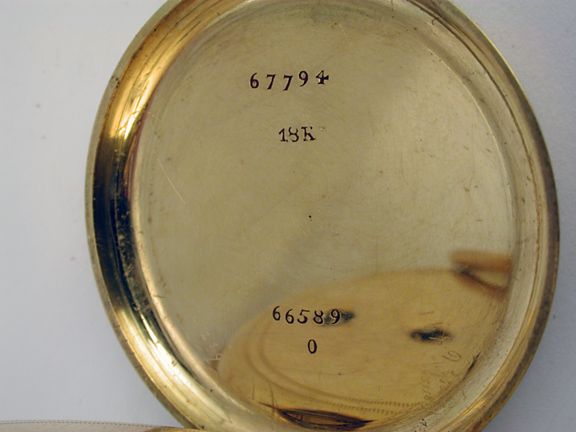 5/0 Size (jewel size), 18k yellow gold, four leaf, pendant pocket watch in a hunting case marked on the inside cover for 18k gold with no evidence of hallmarks noted. 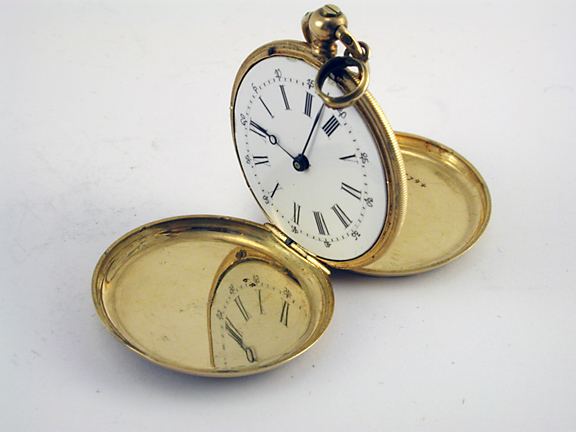 A ball shaped gold pendant and oval bow are placed at the three position (savonette) opposite the case hinge. 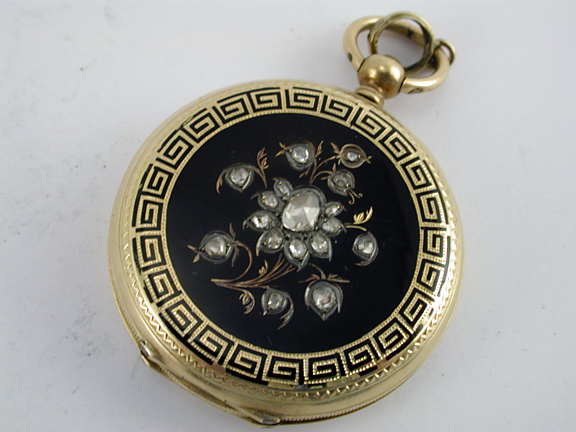 The two outer covers are gold with black enameleing or onyx decorated with clear gemstones, perhaps mined diamonds, in an arborial form with Greek key design at the circumference of each cover. 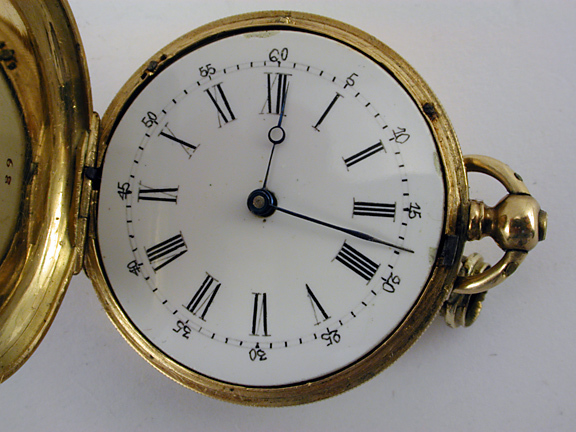 White unsigned enameled dial with Roman hours, closed minute ring with Arabic markers placed every five minutes along the edge, steel breguet hour hand and steel spade-variant minute hand. 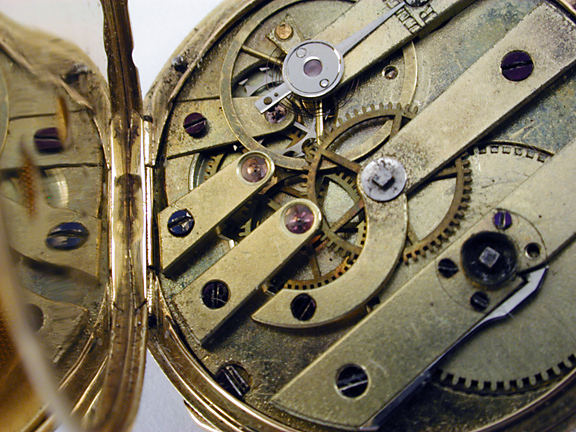 Movement: An unsigned, key wound and set, Swiss bar or finger bridge movement with straight parallel finger bridge and a curved center wheel bridge with three arm monometallic balance wheel and swiss style index regulator. 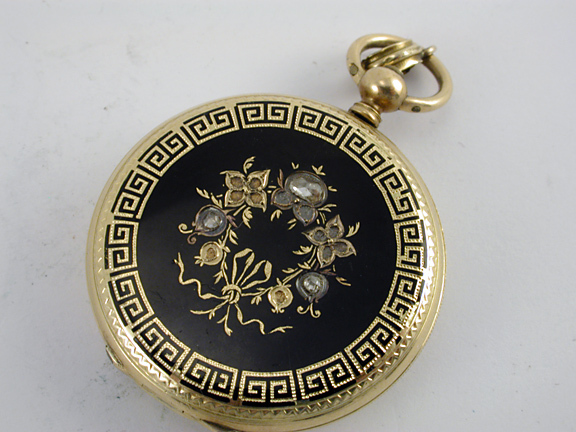 I am going to value this watch as if these are non precious jewels on the case since there remain questions about this gold case. The Swiss legally required proper gold hallmarks and there are none here. The dial is a big hurt to value because of the non professional restoration of the minute ring and the Arabic minute markers. If, in fact, the case is 18k gold and the gemstones are genuine mined diamonds then the watch would be worth the value of the gold case and the value of the diamonds once their quality is assessed. That could only be done by a jeweler in person. One hand replaced. Movement needs an overhaul. 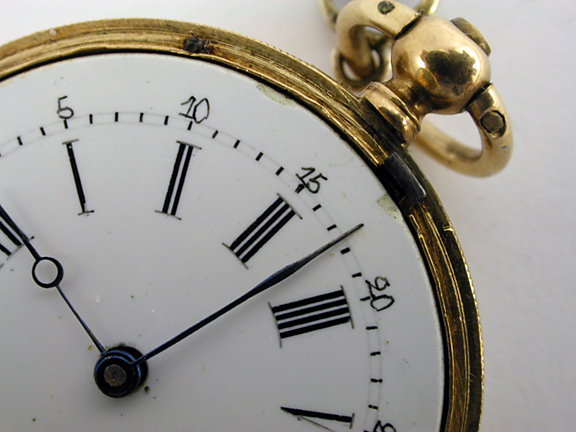 I am valuing this watch as 18k gold and as if sold on the watch market.